Just because a woman is - gasp! - 37 years old does not necessarily mean that she is past her prime. As far as just physical attractiveness goes? Of course it does. We could dig up a GWU yearbook from the late '80s / early '90s when she went there and confirm this. "We could dig up a GWU yearbook from the late '80s / early '90s when she went there and confirm this." So long as we're not unduly influenced by hairstyle. Oh, well, you are not going to be distracted by that, so I'll take your word and my intuition for it. Nice to see I'm not alone in appreciation of Mrs. Edmonds. I was kind of surprised at Steve's blog when she was being contrasted with Valerie Plame in the looks department. It's evident that she's past her peak, but she retains enough of it to still be pleasing to the eyes. Are Azeris considered Persian? I initially assumed she was Turkish. Exotic? She's the spitting image of my Irish mother. What city is your Irish mother from? I ask because a reader from Ireland keeps saying that we Americans are deluded about the "dark Irish" beauty, which evidently exists only in the US, probably due to admixture from other groups. For example, Jennifer Connely is only 1/4 Irish, ditto Sherilyn Fenn. Beauty, real beauty that derives from things like excellent bone structure, confers such advantage even when aged. This woman, like many other late 30s-early 40s celebrity beauties I can think of, look better at their current, past their prime age than most women will at their peak. I had an acquaintance that went to George Washington and he'd constantly extol the hotties of Persia. I didn't know what he was talking about when I first met him, me being from the Midwest, but after visiting him there once, I'd have to agree with him and you. GW has lots of hotties huh? I'm actually applying to GW for law school - so that info comes in handy...back to my LSAT studying. Re. babe theory of political movements" I think where you'll find the hot babes is in movements and institutions that are already powerful or are at their peak, rather than in nascent political movements. Those are populated by neurotic, bookish, and wounded women. 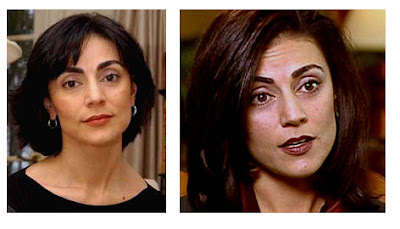 Speaking of pretty Persian protesters, Marjane Satrapi (author of Persepolis) was probably pretty good looking back in her youth.